We started this week by reading "The Very Hungry Caterpillar." The children really enjoyed this story. And of course, this led us to many of our activities throughout the week. 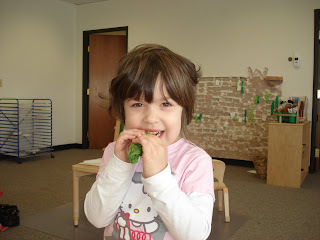 One of the favorite places to go was to home living where the children had the chance to "feed" a caterpillar. I really enjoyed watching the children in the block area. At the beginning on the week they went into the area to build things from the story. Some built a cocoon for the caterpillar to sleep in; Jayden, with a little help, enjoyed building a caterpillar and some food for the caterpillar to eat! 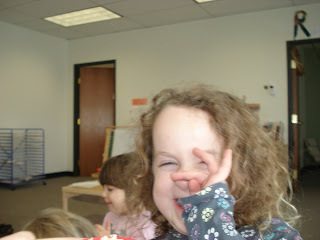 On Monday the children also had the chance to make their own caterpillars out of egg cartons and paint! On Tuesday we took the art activity a little further and the children made cocoons out of paper rolls and then they decorated a butterfly that is rolled into the cocoon so it can come out when it is ready! Starting on Wednesday we added the story, "The Very Busy Spider." The children enjoyed making a string spider web after we finished the story. 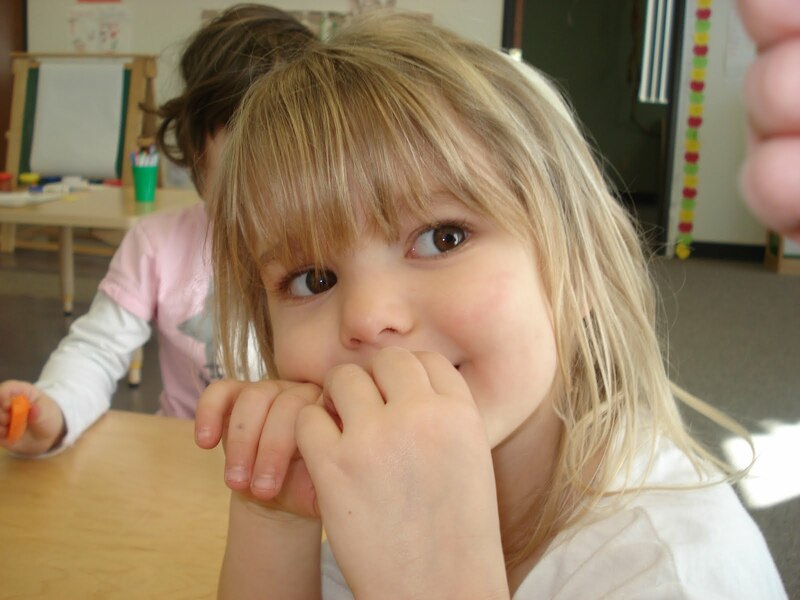 Then they went into the classroom to do more bug activities. In writing the children wrote about what they do to stay busy at school. In art they did spider web rubbings and they also made shiny glue spider webs! Some children enjoyed returning to the block area where they tried to use the blocks and string to make a spider web. Other children enjoyed the math activity where they used "The Very Hungry Caterpillar" book to remind them of the order of the foods that the caterpillar ate. Then they had to match the day, the number, the food name and the food picture for each day. Throughout the week the children also enjoyed doing the bug pattern block cards. These are always out in the classroom, but sometimes they are forgotten about so it was nice to see the excitement over these again! 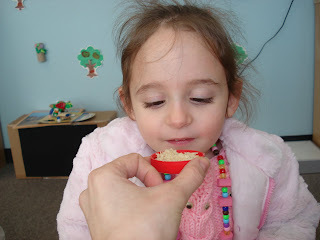 I think the most exciting part of the week for the children was snack time on Wednesday. When they saw me take out the paper plates they started asking me what we were making. I put out 5 plates on the table and they all started telling me that we had a plate caterpillar on the table. So we got wiggly eyes and a pipe cleaner antennae and made it really look like a caterpillar. Then I added the fruits (one type of fruit per plate) that the caterpillar ate in the story. After we "fed" the paper plate caterpillar we cut up the fruit and each child got the same amount of pieces that the caterpillar ate of each fruit! It was a very yummy snack! 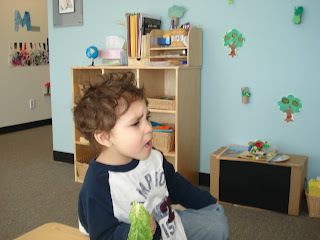 Tyrus: Teacher, the caterpillar has a tummy ache. He needs his leaf. Where is his leaf? Lizzy: I can make a leaf! I can draw one! Levi was very proud of his cocoon he made. However, when I called it a cocoon he responded by telling me: "I built his bed!" Next week we are going to continue to talk about different bugs. We will be reading the book, "The Grouchy Ladybug" and "The Very Lonely Firefly." We will be talking about time and learning a little about a clock as well as talking about friendship and feelings. We are also going to do a fun project where we will be able to "grow" our own bugs! Staying "busy" at The Gan while writing about what she does to stay busy! He is so proud of his cocoon for the caterpillar! Welcome back from break! I hope everyone had a wonderful Passover holiday! I know that the children came back ready to learn more! Although it was a short week, we still spent plenty of time learning! The children really seemed to enjoy the introduction to our author study. We will be spending a number of weeks looking at books by Eric Carle. We will also be developing some special art projects that will be inspired by the way he makes his book illustrations; and this week we started our study! Since Eric Carle uses lots of colors in his artwork, we talked a lot about rainbows. The children helped hand paint a rainbow, which can be found on the bulletin board in the play room. We talked (and saw) how light through a prism can make a rainbow. We also tried to see rainbows through crystals and the children decided that we should hang them in the door so we can get the rainbows from the sun. Although we are not putting them in the doorway, we did hang them and as we get to much sunnier days we may move them around the room to find a better spot for them. Right now the children decided they should be the chandelier in the home living area. Continuing with colors, we read the book, "Hello, Red Fox." When reading this book the children were able to look at a specific color animal and then look at a blank page next to it and see the opposite color (as found on a color wheel) in the same shape. Some children even tried to draw their own animals and make the same thing happen. We also had the opportunity to make "color soup" and mix it to see what colors we could make! While reading the book "Draw Me A Star" the children heard all about drawing different pictures and some chose to make their own stars in the art center. And while we were being artists, this week in home living we decided to be painters instead of cooking. The children decided to take the paintbrushes into the home living area and pretend to paint. Some even chose to wear paint smocks! We also made popsicle stick shapes to go along with our book "The Secret Birthday Message." And just to bring this book to life, we received our new block shelf today and the children had to solve the shape riddle (just like in the book) so they would know which blocks I need to either take off the shelf or put on the shelf! One of the favorite activities was a snack activity. On Thursday we made a fruit salad rainbow. We had lots of fun with this and even had a great discussion! Mussie: We are going to have a funny snack. We are going to have a rainbow snack! Morah Amanda: Yes, we are going to have a rainbow snack. Morah Amanda: What color comes first in the rainbow? 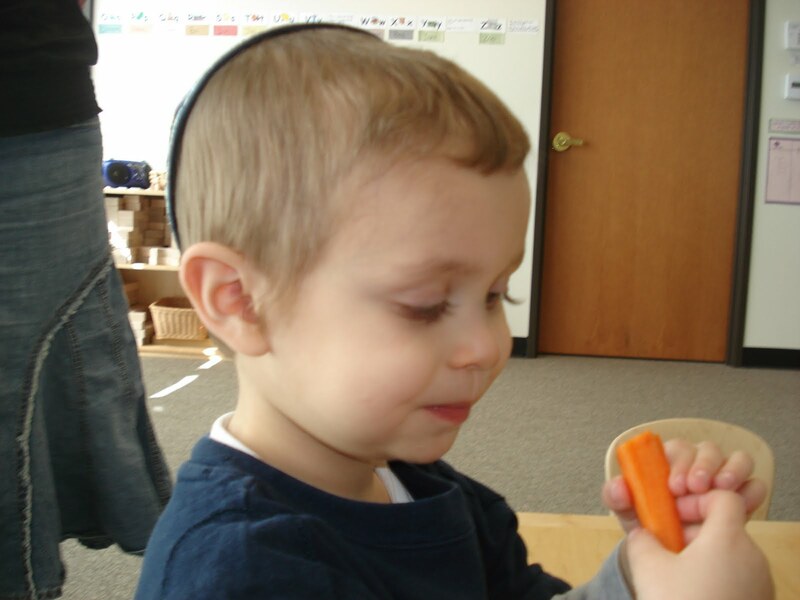 Morah Amanda: And what fruit is red? Morah Amanda: What color comes next? Morah Amanda: Orange. And what fruit can we use for orange? Tyrus: I see green in the rainbow! 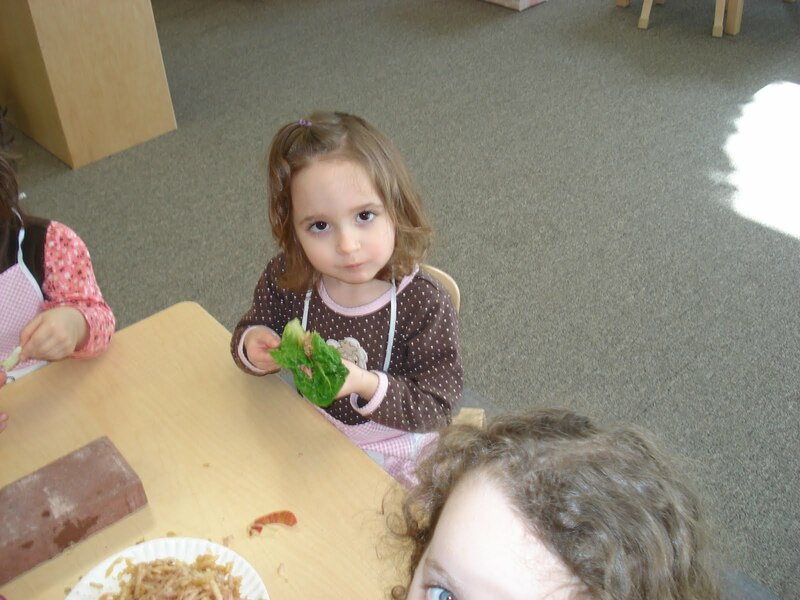 Morah Amanda: You are right, but we aren't to green yet. What fruit could we use for orange in our rainbow? Morah Amanda: So we used strawberries for? Morah Amanda: We used oranges for? Morah Amanda: And what fruit do you think we could use for yellow? Levi: Now we made the top of a rainbow! Morah Amanda: We have red; we have orange; we have yellow. What other color do we need? Morah Amanda: What do you think we could have that's green? Tyrus: It smells so good! Morah Amanda: We are going to skip blue cause we couldn't find blueberries and we are going to move to purple, or actually something closer to indigo. And what are we going to use? What fruit would be a purpleish-blueish color? Morah Amanda: Now we have made a rainbow fruit salad! Next week we are going to focus on some of Eric Carle's books that talk about food. 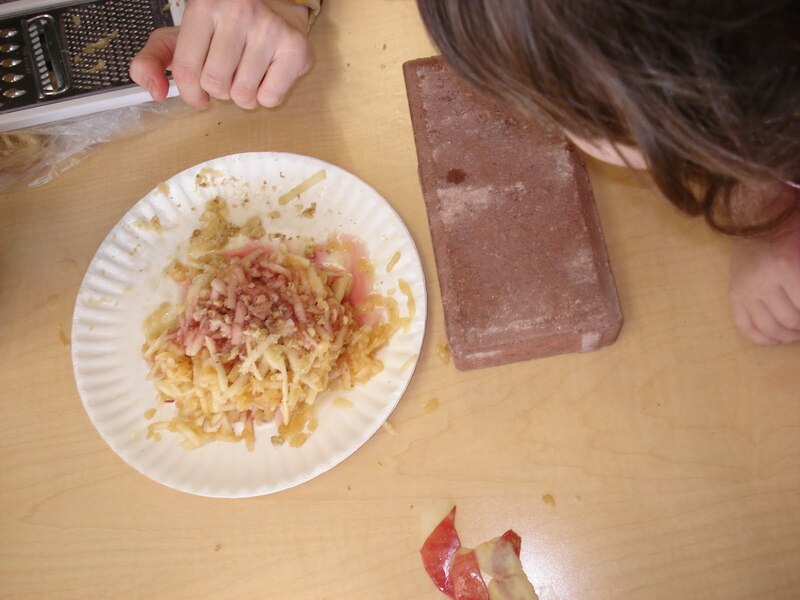 We will be making some food in the classroom. 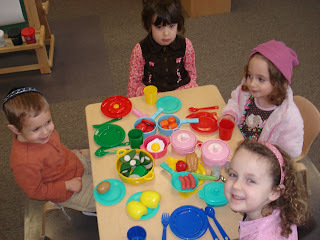 While we are going to do some real cooking, we are also going to be pretending to cook and will be taking classroom items and using them to make foods. We will also be talking about the days of the week and writing words that begin with the same letters as the days. some kids were brave enough to taste the Maror "Bitter Herbs" that are traditional on Passover. Other kids just smelled it. We compared it to other sweet vegetables like carrots. All the kids tasted quite a few of those! The kids compared the color of our homemade charoset with a real brick, which is what the charoset symbolizes. 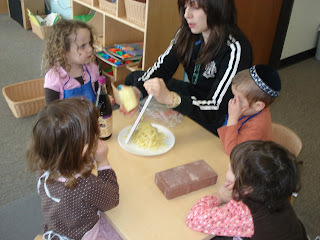 the kids set their own seder during play time and sent out invitations to all the other kids.